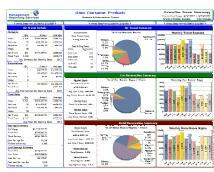 Agency Views is an easy-to-use “add on” to TRAMS and ALPHA Accounting systems. It is a reporting tool designed to seamlessly integrate information from your accounting system to a simple menu-driven list of reports. Agency Views provides you with enhanced versions of many travel industry reports, including Fare Savings, Air/Car/Hotel Activity and Traveler Detail. Agency Views also provides you with additional critical reports directly from TRAMS or ALPHA. We have taken the best agency back office software and made it even better!! You can master Agency Views within minutes! Reports are simple and easy to run. If you ever tried to run a system that was too complex, you probably avoided it. With Agency Views, reporting becomes effortless. Agency Views began with one Travel Agency who could not get the information they needed to effectively manage their business. They guessed. They hoped. They just didn’t know. Now they know their business and their clients better than ever. For more information, or to schedule a demo, call Patrick McIntyre at 888.827.0072 or send an email at Patrick.McIntyre@MRTGrp.com. ©2015 Management Reporting Technology Group and Management Reporting Services. All Rights Reserved. Microsoft's Internet Explorer (IE) versions 6 to 10, Mozilla Foundation's Firefox versions 2 and up and most versions of Google Chrome. All other browsers, including Internet Explorer version 11 and higher, are not supported and may display unexpected behaviors. If you have issues viewing this site, click here to contact the site administrator.